Includes: * Vegan Chocolate Waffles * Sweet Potato Dinner Rolls * Pesto Veggie Burgers * Vegan Chick'n Taquitos* Chunky Monkey Cake ... and hundreds more! Enjoy the numerous benefits of meal prepping especially for the vegan diet with this helpful guide! The hardest part of starting any new diet is committing to it—the vegan diet is no exception. You have every intention to stick to a plant-based diet…but then you get home from a long day of work and the urge to just order a pizza overcomes you. This is where meal prepping helps! By making all of your meals ahead of time and having them easily accessible and ready to go, it’s easier to fight off the cravings and stick to your healthy new diet. It’s also a great strategy to save tons of time and money! 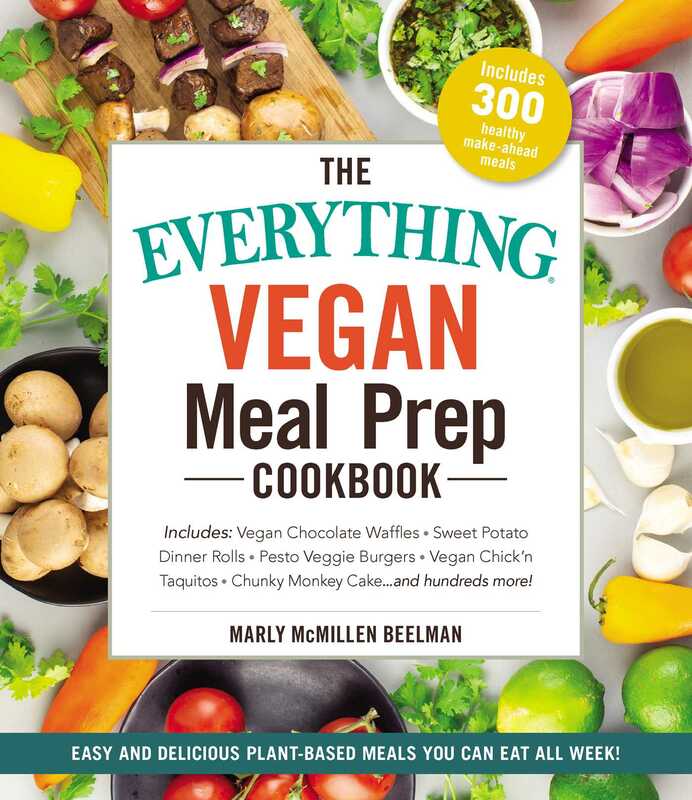 The Everything Vegan Meal Prep Cookbook provides hundreds of vegan recipes that make it easy to commit to your new diet—from a quinoa burrito bowl to slow cooker tortilla soup to fruit-on-the-bottom overnight oats, there’s something for every meal of the day! With this book and just a little advanced planning each week, you’ll be able to make simple and delicious meals that will prevent cravings, help you lose weight and eat healthier, and save time and money! Marly McMillen Beelman is the founder and president of Namely Marly, a blog and online presence focused on providing resources for healthy lifestyles, creative living, and easy vegan recipes. Marly is a former consultant, executive director, and COO turned entrepreneur. She has an MBA from the University of Missouri-Columbia and worked her way up the corporate ladder. Marly earned a certificate in Plant-based Cooking/Health from Rouxbe Cooking School to better hone her skills in developing and sharing healthy, delicious, and easy vegan recipes. Marly has persevered through her own health conditions, including Gallbladder Disease, Lactose Intolerance, and IBS (irritable bowel syndrome), until finally discovering that a plant-based diet was the perfect way to feel healthy and energetic.She’s also the founder of the Chopped Academy, providing resources and guidance to others venturing into a food/healthy living-focused entrepreneurial business. She hosts the Chopped Podcast where she interviews food bloggers and experts from around the world.